Nefyn (Welsh pronunciation: [ˈneːvɨn]) is a small town and community on the North West coast of the Llŷn Peninsula in Gwynedd, Wales. 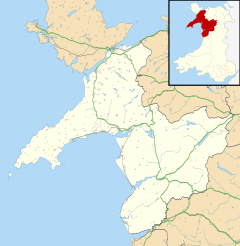 Historically in Caernarfonshire, it has a population of 2,602. Nefyn is popular with visitors for its sandy beach, and has one substantial hotel. Welsh is the first language of almost 73% of its inhabitants. The A497 road terminates in the town centre. The community includes Edern and Morfa Nefyn. The history of the area can be traced back to 300 BC with the Iron Age hillfort of Garn Boduan overlooking Nefyn. The remains of 170 round stone huts and ramparts are still visible on top of the 917 feet (280 m) hill. The earliest known reference to Nefyn in documents dates from the latter part of the 11th century, when it is mentioned as a landing place of the Welsh prince, Gruffudd ap Cynan. Gerald of Wales, writing in his account of a journey around Wales in 1188, says that he slept at Nefyn on the eve of Palm Sunday. Nefyn was the location of the court of the commote of Dinlaen: part of the cantref of Llŷn. Edward I of England held a jousting tournament in the town in 1284 to celebrate his victory over the Welsh, emphasising its importance at that time as a trading town. In 1355 it became a free borough and remained an important centre of commerce. The sea was always an important part of the economy of Nefyn; and fishing, particularly for herring, became the prime trade for most of the 18th and 19th centuries: so much so that the town's coat of arms bears three herrings. Herring were locally referred to as "Nefyn beef". In 1910 Nefyn had 40 herring fishing boats, but herring fishing ceased around the time of the First World War. The area nurtured many ship's captains in the age of sail, and shipbuilding was also an important local industry. About 3 miles to the south-west is Madryn Castle, home of Sir Love Jones-Parry, one of the founders of the settlement of Puerto Madryn in Argentina. The foundations of the old St Mary's parish church date from the 6th century, although the present building was erected in 1827. It would have been an important staging post for pilgrimages to Ynys Enlli (Bardsey Island). The old church is no longer a place of worship but houses a museum dedicated to the maritime history of Nefyn. Since 2013, archaeologists have been investigating the area under the church and have uncovered a 13th-14th century brooch and the remains of a lady buried sometime between 1180 and 1250 in an older form of entombment called a cist grave. Nefyn is now part of a wider ministry area led by former hostage negotiator and Arsenal fan the Reverend Richard Wood. The place name is of uncertain origin. It is recorded as Newin in 1291, and as Nefyn in 1291. It may represent a personal name. The Romans recorded a tribe occupying the peninsula called the 'Gangani', who are also recorded as a tribe in Ireland. Nefyn and District Golf Club was formed in 1907. The course added a further 9 holes in 1912 and a third set of 9 holes in 1933. The current course is made up of a front ten with a choice of two back eights. It is set high on the sea cliffs of the narrow peninsula overlooking Porthdinllaen bay. Since 1929, Nefyn has played host to a Beach Mission, which runs for two weeks at the beginning of August each year. Nefyn football club, Nefyn United F.C., was formed in 1932 and has enjoyed some success over the years, winning numerous league titles. At present the senior team competes in the Welsh Alliance League: it was promoted from the Gwynedd League in 2005-06. During the Second World War, the Royal Air Force built a Chain Home radar station to the south-west of Nefyn. A tremor in the area on 12 December 1940 was reported by the Cambrian News as having caused two fatalities including John Thomas of Nefyn who died of a heart attack. On 19 July 1984 an earthquake measuring 5.4 on the Richter scale had an epicentre near Nefyn. This was one of the strongest tremors recorded in Britain for recent times but caused little structural damage. Nefyn is twinned with Puerto Madryn, a town in Chubut Province in Argentina (see Welsh settlement in Argentina). There are two electoral wards within the confines[clarification needed] of Nefyn (Nefyn and Morfa Nefyn). The population of Nefyn Ward at the 2011 census was 1,373. Harpist John Parry (ca. 1710 - 1782) known as Parry Ddall Rhiwabon (Blind Parry of Rhiwabon). Sir Thomas Duncombe Love Jones-Parry (1832–1891), 1st Baronet, Liberal MP and one of the founders of the Welsh settlement in Argentina, inherited the Madryn estate near Nefyn in 1853. Elizabeth Watkin-Jones (1887–1966), author of children's books in the Welsh language, was born in Nefyn on 13 July 1887. Actor Rupert Davies (1916–1976), who played Maigret in the eponymous BBC television series in the 1960s, is buried at Pistyll near Nefyn. Singer Duffy was brought up between[clarification needed] Nefyn and Pembrokeshire. Footballer Dylan Sion Jones played for Nefyn for many years and represented[clarification needed] the North Wales Coast Football Association. ^ Roland Bond (2008). Nefyn: The story of an ancient Gwynedd town and parish. Gwasg Carreg Gwalch. ISBN 978-1-84524-124-7. ^ Mills, AD (2003) . A Dictionary of British Place-Names (EPUB). Oxford: Oxford University Press. ISBN 0-19-852758-6. ^ "Scripture Union - Nefyn". www.scriptureunion.org.uk. Retrieved 24 June 2018. ^ "Nefyn Ward population 2011". Retrieved 17 May 2015. ^ Llyfrgell Genedlaethol Cymru. "Elizabeth Watkin-Jones". Retrieved 29 May 2009. Wikimedia Commons has media related to Nefyn. Nefyn.com - This site contains stories and photos from a former Nefyn resident. Nefyn, Wales Recollections from America. Brian Owen (2012). LULU. ISBN 978-1-105-54781-2.